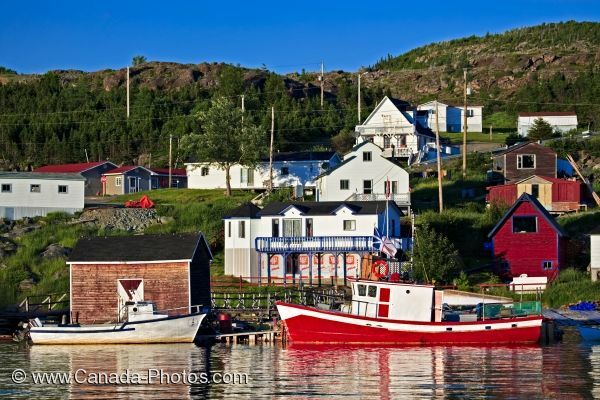 Houses sit along the green hillsides of the Fleur de Lys in Newfoundland Labrador and fishing boats moor in the harbour of this small community. The Fleur de Lys is a very small community on the northern point of Baie Verte Peninsula in Newfoundland Labrador which was once a favourite spot to fish for the French fishermen. Boats dock along the pier in the harbour of Fleur de Lys as fishing is still a main source of income for some as well as the new possibilities of gold finds. Picture of the fishing boats moored in the harbour of Fleur de Lys Harbour in the Baie Verte Peninsula of Newfoundland Labrador.